Place flour, yeast, and salt into a mixing bowl. Add water and oil and beat for 1 minute. Place dough (it will be sticky) on a floured surface and cover with a towel. Let rest for 10 minutes. After 10 min., preheat a cast iron skillet to med-high. Divide dough into four and shape each piece into a ball. Roll each ball into a 6-inch circle. Cook on ungreased hot pan about 1 minute per side. Notes: To make whole wheat flatbread use 1/2 whole wheat and half all-purpose flour. 101 Comments on "Quick & Easy Flatbread"
Thanks for the great recipe. I was in a time crunch and found this,thank goodness! Light,tender and fast! Definitely will keep this one handy. If the bread is flat, why you add the yeast? These were so yummy,soft,quick and easy. I doubled the recipe and added a tablespoon of sugar just to have softer flavor instead of a plain salt bread. It turned out great! My dough was soft and fluffy and was easy to roll out. We used some for little pizza (we love pizza) and the rest I freeze in a Ziploc bag for when we need to make a quick pizza or sandwich. Just put your toppings over your frozen bread,pop them in the oven and they come out so crispy and tasting fresh. Great recipe (its my favor after trying at least 15 different recipes) Thanks for sharing!! Made these tonight and used them for little pizzas. They came out fantastic. This recipe is a keeper. Thanks, Jenny! Should they be cooked in the pan on medium high, that was too hot for a dry food. I did and it smoked up my whole house because the pan was dry and too hot. It said not to oil it. It’s for a cast iron pan, which can tolerate the high heat. She’s using a gas stove which is generally a bit cooler than an electric stove in my experience. If you have an electric I wouldn’t go above medium for this, otherwise there will be burning and sticking and smoking. So I have making your easy pan pizza for many years. Decided to give this a try to go with the salad I was making for dinner. It was so easy. The family loved it . My husband is trying to come up with all the ways to make it into a meal. We’re thinking tacos. Thank you so much! Jenny, have to tell you…I enjoy your videos so much. It is so relaxing, I’m learning a lot from you and your humor is fantastic. Please, don’t ever stop! Thanks so much, this is delicious! I used the recipe to make flatbread pizza baking it for an additional 7 mins at 425 F. Turned out great. Love this recipe, easy, delicious and fast. I knead it by hand. I made them and we loved them! Made some hummus to go with it. I have included this as one of my go to recipes. Thank you so much for this recipe! This will be my favourite go-to bread when I don’t have hours to let regular bread rise, cook and cool. I doubled the recipe for our family of 6 (almost 7), and used the whole-wheat version. I had to use all my will power not to eat more than one, as I have to save enough for our lunch tomorrow. I smeared some butter on a freshly cooked one and devoured it! I know my family will definitely love it. May God bless you, Jenny! I use this recipe all the time. Thanks, Jenny! I always double it and keep the extras in a ziplock bag in the fridge for quick use. I mix a container of pizza sauce and keep in fridge. Always cook extra sausage patties so as to have the leftover ones to crumble over the pizza along with pepperoni, onion, black olives, peppers and of course, lots of cheese. So easy to quickly put a pizza together and cook in the convection oven. Good, homemade pizza in a flash. I love this recipe, my pizzas love this recipe, my waistline? Eh, that’s another story. lol Thanks again, Jenny, for this wonderful, easy to make recipe. I am so happy to find this recipe! Today will be the 4th time i made it. I add 2 spoons of flaxeed to mine. Love it! I was just about to run out to the store for flatbreads then I remembered watching your video, your recipes have never failed me before so I made them for the first time, you are right! I will never buy flat bread or tortillas again! I made the dough in my food processor, rolled half much thinner to experiment, perfect tortillas! Dough was so easy and fun to work with, thank you for making my life easier although you’re not so good for the economy, if I had gone to the store I would have returned with at least 10 other groceries items (mostly junk.) THANKS AGAIN. Great bread with New Mexico Style Posole Soup. Turned out better then any of the others I have tried. Simple quick and very tasty. Even better when cooked on the charcoal grill. Just to let you know…the quick loaf that I am baking today in my dutch oven is rising..:) and I just finished a batch of flatbread..which we are enjoying with hummus. I did have to make an adjustment to the amount of flour. 1/3 cup more to get it to bind together. It was otherwise delicious and one I will keep in my arsenal of go to recipes..Thank you Jenny! Am going to try this recipe approach with gluten-free 1for1 flour. I will let you know how it works out. Have all but given up flour – except what comes over from Israel as I believe that grain has not been messed with genetically. Kosher for Passover means, to me, that the grain is ancient and has had no alterations – same as G-d gave us from the beginning. There is a company called Bread Beckers on the Northwest side of Atlanta that has wheat that is not GMO or treated with pesticides. The email is breadbeckers.com and the phone number is 770-516-5000. I have 3 – 45 gallon pails of wheat berries( soft white, hard white and hard red) in my home and I grind my flour from this wheat to bake. I have only used cast iron so please look at other recipes to see if other pans can be used. I don’t have a cast iron skillet. I make these all the time and just use a frying pan. I have used a griddle, it’s larger and you can cook more than one at a time. We moved to Maine and I can’t seem to find any decent pita bread where I live. But now I can make my own. I just made this recipe and it was so easy, quick, and they tasted so fresh and good. So much better than the packaged bread. I made fresh hummus and the two went together perfectly. Thanks for sharing this recipe. I can’t wait to make it again! Thank you for catching my mistake. I should have just left it at half & half and will adjust the recipe. So it should be 1/2 cup + 2 Tbsp. of each flour. Jenny, you are a delight, and an inspiration when I become bored of my usual fare. Your smile and bright eyes infect people with good feelings. Your site is a bright spot on the internet. God bless you, and may you continue to show us just how easy it is to make things from scratch. This is my new go to recipe! Thank you so much. I have a question. I’d like to cook this for a crowd, so just simply multiplying the ingredients. But it doesn’t seem prudent to multiply the yeast. Do you have any recommendations? I’m thinking about making 60 flatbreads. I wish I could help but I have only made four at a time. You may have to look at other recipes to help with the amount of yeast. Why not just make ahead and freeze? I just made four and froze two, double wrapped. Just love them. I love your cooking! Thank you so much for your great videos. I am allergic to yeast. Would your bread recipes work with sour dough? I’m sorry I have no experience with sourdough. Hello Jenny, I made this recipe this morning to try it out because I am looking for something else to use rather the buying a loaf of bread for my lunches. I let the dough sit for 10-15 min and it didn’t really rise. I used the correct temp of water. I rolled them out to six inch sized and they ended up around 4 inches by the time I got to them to put on my grittle. They cam out very good. But I’m not sure if they are suppose to be really dense or more fluffy. Not quite like a thick fluffy pancake but not dense. When I go to bent it as if into a taco shape it breaks. I did mix by hand for a min or two before I let it sit. A couple of suggestions: It might be a good idea to watch the video again. If you have an electric mixer, it’s better to use it. The dough is not supposed to rise, only rest for 10 minutes. If the flatbreads are not soft enough, it could be from the pan not being hot enough or not rolling them big enough. A cast iron pan will give the best result. If you try again, be sure to follow the recipe exactly with no changes at all. I make these all the time and they are always soft, puffy, and flexible. Good luck! HEY Jenny, how is it going? I watch your video on how to make flat bread and i just love it i will try and make it at home i love flat bread.thank you for your video.. I have used this recipe several times because my grocery store runs out Naan almost as soon as they get it in. It goes perfect with my Tikka Masala and Madras curry! I ended up doubling the recipe and adding minced garlic and fresh cilantro and it turned out perfect and tasty. This is a must-have recipe!! I also did it all by hand because I don’t have any mixers. I’m wondering why this flatbread takes such a shorter time than others that also use yeast. Usually the rising process has to take some time, but yours doesn’t need long–why’s that? Thanks so much, this is a very useful recipe. I didn’t have time to make pita for souvlaki tonight so went in search of a quick flatbread. This looked like it would fit the bill. I doubled the recipe and used white whole wheat flour and it was perfect. I didn’t even bother to get out my mixer. Thanks! This is definitely in rotation now. Another great recipe fromJenny. So quick and easy. Thank you. This is my first time trying to make flatbread, so I want it to come our perfectly the first time. I have some quick question before I begin. 1. Can I use a hand mixer In place of the stand mixer? 2. Does the water have to be exact? I own a regular thurmomiter, but no cooking ones. Thank you for your time, hope to hear back soon. The dough may be too thick for a hand mixer but you can mix it by hand. You will also have to knead it by hand for about 50 to 100 turns before resting. The water needs to be as close as you can get it to the right temperature. Keep in mind that hot tap water usually comes out at around 120 or 125 degrees F.
I used your homemade tortillas recipe . Although, your recipe from YouTube is different from what you have in your site , I am assuming both should work. However, I used your YouTube one . It was disaster ! I just am wondering what I did wrong . I followed your instruction carefully. The water was not enough to hold the Flour ! So I added one more cups . Still did not hold them together . Would you please let me know what I did wrong!! My printable recipe and youtube video for this flatbread are exactly the same and this is a proven recipe that I make regularly. I only post things that I make at home. It’s possible you may have measured incorrectly or may have confused this with my recipe for tortillas. (my tortilla video is also exactly the same as my tortilla printable recipe) Please try again, measure carefully, always aerate your flour before measuring, and let me know how it turns out. I’m not sure why you say the video and recipe are different when with both my flatbread and tortillas, the videos and recipes are exactly the same. I have just recently found you and your wonderful recipes, video’s and humor. 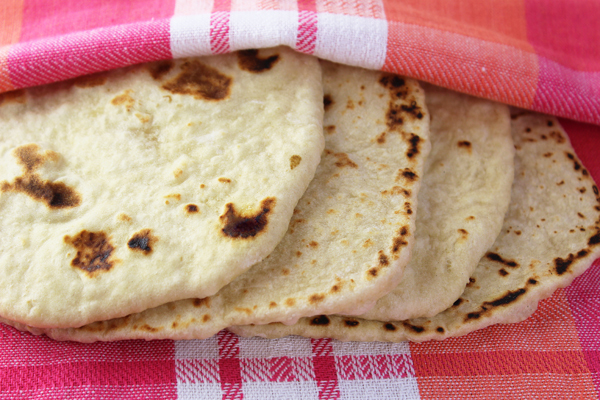 We love the homemade “pita” (flatbread) and soooooooooo easy to make. I will never buy any again! 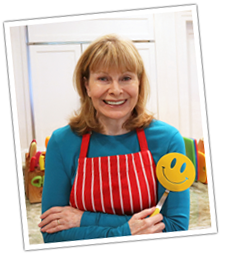 Thank you, so much for sharing your cooking experience and recipes. Can’t wait to keep trying all of them. Oh! yeah, I love the healthier eating about it too. Can this flat bread be made ahead and then frozen? Brilliant recipe and have now passed it on to my family Thank you so much for sharing. Fantastic! Made these tonight and will definitely be making them again! Yummy and so easy! Love the potato flatbreads and I have only just “discovered ” you on You Tube. What a fabulous set of recipes. I just love the way you present your episodes. You are brilliant! I am now a confirmed follower. keep those recipes coming! Hi jenny!😊☺I made the pita recipe and it turned out great! Ty so much. I will be making my own for now on. So yummy! I’ve been making lots of flatbread lately, since our oven is currently broken. I love how soft and fluffy these turn out, especially with how fast they are to make. I make them on the electric griddle so I can do 3-4 at a time, depending on how big I make them. Thanks for the wonderful recipe! Love this recipe. I actually didn’t see the part at the bottom about how to sub whole wheat flour, and just used 1 and 1/4 cups of all whole wheat plus a little extra water to bring it together – comes together beautifully and tastes amazing! such an easy recipe we even make it during the week. thanks! I love this flatbread! I have made it many times and it always turns out fab. I like to keep these flatbreads on hand for making flatbread pizza, as a wrap for simple tossed salad ingredients or eating with whatever I’m having for dinner. When eating them for dinner, I dip them in a combo of extra light tasting olive oil flavored with any seasoning grinder such as Italian Herb. Try it – you’ll love it too! Can the dough be frozen, after making it into a ball? Then, do an overnight defrost in the fridge? If this is possible, would dough need to come to room temp before proceeding? I have no experience with freezing yeast doughs so you may have to look around for that information but if you do freeze it you need to defrost it overnight in the fridge and bring it to room temperature before rolling. you make me laugh, i learn something and you are always funny thank you. I Love all your recipes, The ease My grandkids are going to love this. I have two who always order flatbread, I never thought about making my own!! May I ask what is Naam? Do you have a recipe? It’s naan and it is flatbread – it’s the same thing. With Indian cuisine it’s called Naan. 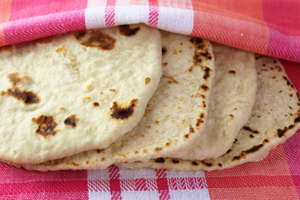 Naan Bread is middle eastern and usually has Yogurt in the mixture. I use this one found online…. Start by making your dough. Combine the self-rising flour and the greek yogurt in the bowl of an electric mixer fitted with the hook attachment. This can also be done by hand. Mix the 2 ingredients until the dough starts to form. If the dough is dry, add 1 tablespoon of water. Continue to knead and bring the dough together. If the dough is still barely holding, add the second tablespoon of water. Place a griddle pan on high heat and let it get very hot. Cook the naan on each side for 2 minutes. Naan should puff up and have a light char. If desired, brush each side with olive oil and a small pinch of sea salt. Once the first side of the naan is cooked, flip the naan over and brush the cooked side with olive oil, sprinkle with about ¼ teaspoon of cilantro and ¼ teaspoon of garlic. When the second side is cooked, flip the garlic side onto the griddle surface for just a few seconds. The hot surface will help seal the garlic to the naan. You can but if it’s a non-stick pan you should not heat it to medium-high as it’s not safe for most non-stick surfaces. Keep the heat at medium but they may not puff up as much as they would on cast iron. These are so easy to make. And filling them, well the possibilities are endless. Thank you for sharing. I look forward to making some more of your recipes. Can you make dough in food processor I don’t have a mixer. Yes, you can. Just process it until it forms a ball. Do I need to knead, and at what stage? There is no kneading with my recipe as long as you beat it for one minute. Wow! Really makes a difference. Thanks.. I was not sure if le creuset or staub. Lodge has much less expensive pans. You should try the Cast Iron Enamel Non-Stick Square Grill Pan/Griddle. The Porcelain coated cast iron is much easier to care for than just the cast iron one. I would look online at Amazon or Bed Bath & Beyond or something similar to check out what is out there. I prefer Amazon as Verified Purchasers do reviews of the products, so you can usually get a good idea from the users of products. I have made several of your recipes and they were delicious! I have a question regarding your flat bread recipe. As soon as I make it – it’s gone. It smells good, it tastes great and I am hoping that you will tell me I can make it for my two granddaughters – both of whom have celiac (gluten intolerance) Can I substitute regular flour with King Arthur gluten free flour and xanthan gum? Using all the other ingredients from your original recipe? I have no experience with gluten-free baking but from my research, that sounds like it could work. Jenny your recipes and videos’ are priceless. Thanks for feeding us and keeping us entertained. Merry Christmas and a Happy 2015. Like the way you prepare reciepes quick & funway! Tried potatoe patty,it was delicious . 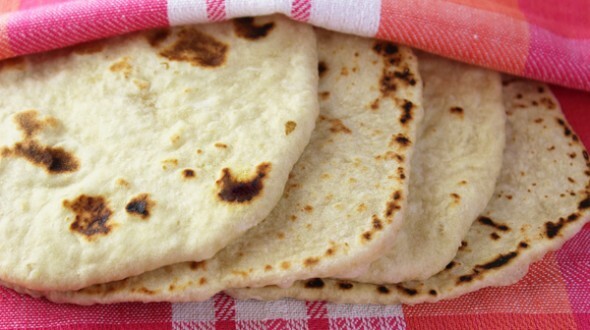 One question can i bake in oven ,these flat breads like pita.or can i freeze ,fridge , dough for next day,cooking? It’s not easy to make flatbreads in the oven. The oven would have to be extremely hot and you might also need a baking stone. It’s much faster and more convenient to use a cast iron pan. You can make the dough in advance, wrap it in plastic and refrigerate, then shape and cook the next day. Can I add seasoning like garlic powder to this recipe or will it be ruined? If i can when should I add it? I would add the spices at the beginning. Hi jenny i just tried this recipe but i think something may have went wrong with my yeast . I bought a thermometer and tested my water, but my dough seemed dry when i mixed everything together. so i tried it again an it came out dry again. i don’t have a stand mixer like yours. i only have the electric beater, you know the ones with the two attachable and dettacable beaters. could this be the reason? A hand mixer should not cause this problem. I think it may be too much flour, which depends on how you measure it. If you’re using stackable measuring cups and you just scoop up the flour you may be taking too much flour if it has settled in the bag or container. It makes a big difference if you stir up the flour to aerate it and measure after that, always leveling it off the top. If that’s not the problem, I would just add a little more water. Most bread recipes are pretty flexible with the ratio of flour and water. Here is some good information on measuring flour: https://www.jennycancook.com/flour-basics/ Keep me posted. I think it might help to weigh your flour. 120gm per cup they seem to say everywhere. Is it possible to make it with only wholewheat flower? You can use all whole wheat flour but you may find them a bit tough and chewy (healthier, though). Will this work in any other skillet? I don’t have cast iron anymore. Flatbread requires a very hot pan and they say it’s not safe to heat non-stick pans too high so maybe a regular pan might work, if the breads don’t stick. I wish I had a better answer – maybe someone else will help out.